Could we actually live with each other in close quarters for an extended period? We thought that we probably could, but it would be nice to know before we splashed out all that cash on a shiny yacht. Thus, to New Zealand: not to circumnavigate in one of the cruising yachts for which that country is justifiably famous, but instead to trundle around the roads in a tiny camper van. The theory went that if we could cope with that, then we could cope with living aboard a yacht. It was a tiny cramped space and we did our best, catering for ourselves using the gas stove provided, dropping anchor in a different town each day, even going so far as breaking down deep in an uninhabited national park miles from any help. We passed all our trials with flying colours, had a great holiday, and emerged with some very firm ideas about interior yacht design. The chief of these was that nothing aboard our boat was going to be dual purpose; we were heartily sick of turning beds into tables, tables into beds, and then finding that whatever it was we needed next was now inaccessible beneath a mattress. Incidentally, while we were in Auckland, we took a turn at sailing the Americas Cup yacht NZ40, which went rather well. One thing that we were agreed upon right at the start was that we weren’t going to skimp in the bed department. This may on the face of it seem like a strange first criterion, but we had both been on boats where the quarters were cramped and uncomfortable and it really puts a damper on your day. In addition, we spend a fortune on orthopaedic beds and mattresses at home, and the logic that engendered those choices is just as compelling at sea. David thought that we were nuts, but suggested that we look into centre-cockpit designs, because these tend to have a decent-sized aft or masters cabin. Given that I was likely to be responsible for running repairs, I wanted a hull material that I understood. Wood and I do not get along, and fibreglass struck me as too flimsy for the open sea. I wanted to come off at least afloat if we hit a sunfish or a shipping container, and so steel was the way to go. Since we were looking at sailing shorthanded, ease of sail handling would be a bonus, so in order to get a smaller sail area it made sense to have two masts with small sails rather than one mast with a big one; hence, we arrived at the concept of a steel centre-cockpit cutter ketch. Looking around at the cruising boats available on the market, we found the world awash with proven circumnavigators that exactly fitted our criteria for the money that we had available. The internet is a fine resource, and we spent many a happy evening examining photos of the interiors of second-hand cruising boats from all over the world. Eventually, however, it started to dawn on us that many of these vessels had been on the market for years, and several became old friends as we followed their stories, eagerly logging on each evening to see if this owner or that had added any new gear or reduced the price again as they got more desperate. We marvelled at all those unfortunate souls, usually Americans, who were apparently stranded in this or that tropical paradise and needed to sell their yacht in order to go home; usually, it seems, because their wives had refused to sail any further and had already flown back home to the US. After a few months of following the fates of all these forty-foot Adams, Roberts and Van de Stadt ketches, we decided to change tack and look at newer, smaller boats, with a view to trading up later once wed got our sea legs. Not only would this make the learning experience easier, but if we chose carefully, we could hopefully get a more modern re-saleable model which would give us the option of ducking out if we decided that, for some reason, the cruising life was not for us. Then came the Sydney Boat Show. We’d expected to be awed by the yachts, and even more awed by the prices, but in actual fact what we saw pretty much fitted our preconceptions, and the prices were not too shocking. Out of our range, but not shocking. We tried every berth in the sailing marina, and found that almost every designer apparently only catered for midgets. I’m just over six foot, and Bronwyn is a little under, so we’re not mutants, but we simply couldn’t fit into many of the berths provided. The only design that really blew us away was the Hunter, an American company that was trying to break into the Australian market. Everything was beautifully made, well thought out, and best of all, made for full-size people. The icing on the cake was that, due to the collapse of the US economy, in Australian terms they were remarkably cheap. We immediately vowed to buy one. The problem, of course, was that since Hunters were new to Australia, there weren’t any second-hand models available. We contacted a few dealers in the US, who pointed out that because of the weakness of the US dollar, they could crate one up, new or old, and freight it to us for less than the price of an Australian model. Although tempting, we couldn’t bring ourselves to buy a boat that we had never seen, and in any case, there seemed something bizarrely wrong about buying a yacht by mail order. In time, a second-hand Hunter showed up in nearby Pittwater. We hopped in the car for the four-hour trek, but were sadly disappointed to discover that the actual vessel fell far short of the published specifications. It was old and tired, the berths were built for children, quite substantial parts just came away in my hand, and the bilges were full of dirty water. A little disillusioned, and facing a four-hour drive back home, we got talking to the salesmen and explained what we were looking for. We produced our two lists of wants and nice to haves, and explained our interest in long beds and reasonable resale value. What you need, they said, is a Bavaria. Now, we had dismissed both Bavarias and Beneteaus early in the game. All of our charter experience had been on these boats, and they were always uncomfortably cramped and badly thought out. In addition, the models that we had visited at the boat show had been shoddily constructed. However, it just so happened that the agent who we were talking to was the sole trade-in dealer for the Australian Bavaria importers, and they also just so happened to have an as-new five-year old two-cabin Bavaria 34 on their books. OK, OK, we’ll go and see it. The price? A snip at exactly twice our available funds. This was not a problem for our enterprising agent (for the record, David Bray Yachts, we recommend him), who put us in touch with a loan company (DB Finance; we recommend them too) who were happy to arrange an almost profit-free thirteen-month loan for the remainder. 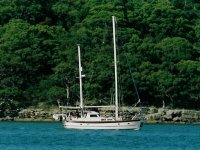 We’d heard that finding a mooring was a problem in the Sydney area; David waved that away, he could get us a mooring nearby. There was nothing for it but to go for survey. This entry was posted in Australia, Oceania, Travel, Voyage of Pindimara and tagged Sail on 2005/08/31 by Reinhard.